We had a wonderful month in Key West at Lilac Cottage. The home and location as described in previous reviews. Great location. Parking is on the street and on arrival we could not find a place to unload easily - but after we were unloaded, we hardly used our car. Compared with renting for over 10 years on VRBO and HomeAway, there seem to be additional higher/add on costs with this rental. The cleaning fee, pet fee, concierge fee and utilities all extra and high. Read all the fine print and look around before committing. We are very pleased that you enjoyed this home during your stay in Key West. While it's true that parking is not always available directly in front of the house, spaces are usually open within half a block or less. Sorry you felt that cleaning, pet fee and utilities were high. We have worked hard to keep those costs in line with other professionally managed vacation homes that are maintained to a very high standard. If those fees were higher at all, we hope that resulted in a cleaner, more meticulously maintained home. The Lilac Cottage was terrific. We celebrated our 1 year anniversary at Lilac Cottage and it was nothing short of amazing. Sitting on the deck, floating in the pool, watching the planes fly overhead, enjoying a cocktail, it truly felt like we were in paradise. The inside is just as beautiful as the outside with all the original pine floors, staircase, etc. Property both inside and out immaculately kept. The location is amazing, quiet street, but SO close to all the sights of Key West. It was a 15 minute walk to everything we wanted to enjoy while in Key West; Duval Street, Mallory Square, Southernmost Point The bike shop right across the street was great for all our biking needs, we definitely recommend hopping on a bike and exploring the island. A little bodega was right down the street that we stocked up on water, snacks, alcohol (while there are a million bars in Key West, you will definitely want to spend a day and/or night just relaxing in the pool). So many great restaurants and bars all within walking distance. Get out and explore an you will find hidden gems everywhere like Flaming Buoy for dinner, great Cuban dinner at El Siboney, late night snacks at Sandys Cafe. We HIGHLY recommend Lilac Cottage to anyone looking for a great stay in Key West, the concierge service was fantastic, made great recommendations and were at our disposable with any questions, needs, etc. 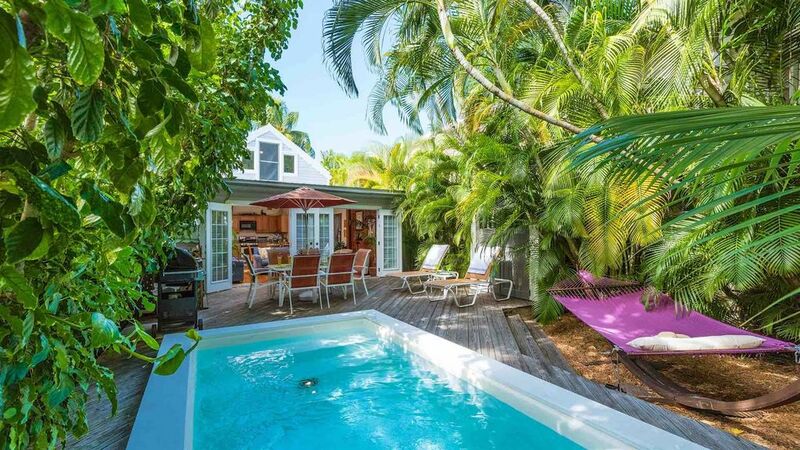 Don't think we could ever stay anywhere else in key West without being disappointed because Lilac Cottage is a little piece of paradise, you may tear up when its time to leave! We stayed at the Lilac Cottage in September and loved it! The house was perfect, that beautiful Key West Style with the gingerbread on the porch, the artwork and that lovely Lilac color! What a Great house, so open, lots of space and beautiful interior. We spent our mornings biking and walking around Key West and our afternoons cocktailing in the fabulous and private backyard. Hours Sitting around the table talking and enjoying (many) cocktails, relaxing in the pool in the sun, and lounging in the hammock and the lounge chairs. Many fun Happy hours and grilling dinner in the yard. We usually are out and about in Key West every night, but in a house as amazing as the Lilac Cottage, we found ourselves very much enjoying our time together at the home. Five star home and service and we can't wait for our next opportunity to get back to Key West for another stay at the Lilac Cottage!